Nine years have passed since Vinod Kumar Jain had filed a public interest litigation to save the water bodies of Delhi. The case is still in the court but meanwhile some lakes in Delhi, have actually turned into cesspools. One such lake is the Sanjay lake of east Delhi. In the beginning of this year, the court asked Rakesh Mehta, the chief secretary of Delhi and also head of the monitoring committee for the water bodies, to find ways to revive the Sanjay lake. 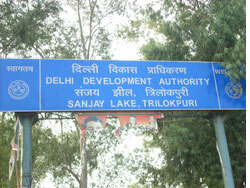 The Delhi Development Authority (DDA) created Sanjay lake in the year 1970. This is a rainwater lake. The lake was to be developed before the 2010 Commonwealth Games but the negligence of DDA and the Delhi Tourism Department who are in charge of the lake has made it a pool full of mud and sewage. Ms. Mini Verma of Mayur Vihar Phase II says, “The sewage enters the lake freely and no one can stand near the lake for a very long time as it stinks”. The lake is filled with water hyacinth and reduced drastically in size according to the residents of Mayur Vihar Phase II. Anil Grover, the president of Residents Welfare Society of Mayur Vihar Phase II says that the residents of this area are fighting to save the lakes for the past five years. The condition of the lake first came into the notice of the residents when the medical Superintendent, Dr. Bhatia of the nearby Lal Bahadur Shastri Hospital said that the polluted lake is serving as a breeding ground for the dengue causing mosquito. Grover tried to bring this to the notice of DDA but failed to get any response. Then he approached the Municipality and with their help added anti dengue medicine to the waterbody. They have written letters to the Chief Minister Sm. Shiela Dikshit about the degraded waterbody.Five years have passed but the government authorities in charge of the lake never took any initiative to clean the lake says Grover. Moolchand Sharma, Deputy Director,Horticulture, DDA, informed Grover that they had sent a proposal to the higher authorities for de-silting the lake. This department repaired the boundary wall between the lake and the pocket C of Phase II. Failing to get any help from the DDA, the residents of Mayur Vihar had taken up initiative to clean the lakes several times. Grover not only wrote to the DDA and the chief minister of Delhi about the poor condition of the lake but filed RTI in the DDA for saving this lake. About more than a month ago Grover was successful to talk to the chief minister on this issue through video conferencing. Grover expressed his concern over the lake in this meeting. The chief minister assured him that she would write to the DDA about this. Rakesh Mehta who heads the committee to relieve water bodies all across Delhi in response to the HC orders had said that they are “looking for scientific ways” to revive Sanjay lake. Grover feels that the government is concentrating only the beautification part of the lake. The chief minister even allotted six more acres for the park adjoining the lake. Nobody is talking about restoring the ecology, says Grover.